Peppertap once again has come up with an introductory offer for new users. Buy your essential groceries and other kitchen stuff and get flat 20% discount. In addition to this you can also avail 10% cashback using your Paytm wallet. 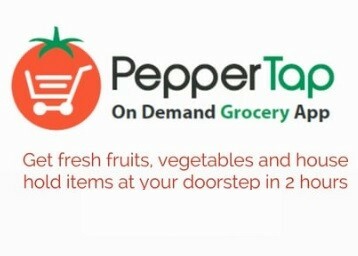 Simply download your Peppertap App and get a privilege to order your groceries from your smartphone and get it delivered at your doorstep and save upto Rs.200. So hurry up!! order now as the offer expires tomorrow. Make your payment via Paytm wallet to avail an additional 10% cashback. Maximum cashback of upto Rs.200 only. Additional cashback is valid only using Paytm wallet. Explore the various offers and get an advantage to shop your groceries online only at Peppertap.